Located in Ortigas Ave, Mandaluyong, Edsa Shangri-La Manila is the only five-star hotel in Mandaluyong. This hotel’s twin towers have 632 rooms with a view of the Manila skyline or Edsa’s tropical garden. The lobby is large and spacious. It’s actually better than many of the other “five star” hotels out there. Don’t forget to go to the lobby lounge; it is beautiful, with lush tropical setting. The room is contemporary in style with a hint of Asian design. The rooms are quite big. They have all the amenities you need in a hotel room, including a hair dryer. The Edsa Shangri-La Manila has a lot of amenities to offer such as the lagoon-style swimming pool, gym and tennis courts, steam bath, Jacuzzi and massage services among others. Speaking of massages, the Chi Spa, offers an ambience that is both soothing and relaxing. They offer aromatherapy massages, facials, wraps, spa manicures and pedicures and others. Before you get your treatment, a consultation is done to ensure that you get the right treatment your body needs. They also have four outstanding international restaurants including, the Paparazzi – a bistro style Italian restaurant, Senju – serves Japanese food, Summer Place – an authentic Cantonese cuisine, and Heat – a buffet style, featuring international food. Due to high volume of tourists staying in the hotel, the Edsa Shangri-La offers currency exchange, which is a big plus. The hotel has state-of-the-art meeting facilities too. It is a popular venue for business conferences. If you want to do some shopping, the Edsa Shangri-La Manila is next to two mega malls. The SM-mega mall and the Shangri-la Shopping Arcade. 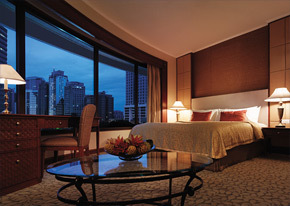 The next time you’re in Manila, make sure to stay at the Edsa Shangri-La Hotel. They have everything you’re looking for in a hotel. The service is great and the Filipino people are very hospitable.